Pdf link to full text in English. 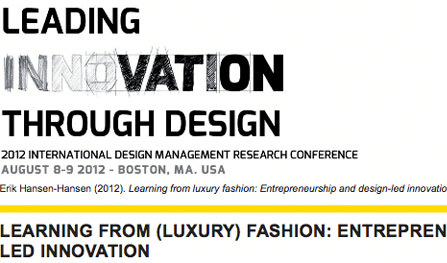 ‘Learning from (luxury) fashion: Entrepreneurship and design-led innovation’ is a conference text by Erik Hansen-Hansen from the Innovation Through Design 2012 International Design Management Research Conference held in Boston on August 8 and 9 2012. It is argued that luxury fashion business serves as a prime example of different design-led innovation methods at work; and further that these can be easily integrated into a specific conception of Design Management. The text can also be considered a major break with the various socialist ideological inclinations in contemporary design and fashion theory.